Excerpt from U.S. Coast Guard “Proceedings of the Marine Safety & Security Council” magazine by Ms. Diana Forbes, managing editor, Proceedings. Lessons learned from marine casualty reports are regularly featured in Proceedings of the Marine Safety & Security Council magazine. These articles explore marine incidents and the causal factors, outline the subsequent casualty investigations, and describe the lessons learned as a result. We will post a "Lessons Learned" feature on this blog once every two months. On March 23, 2006, the passenger ship Star Princess suffered a serious external fire. 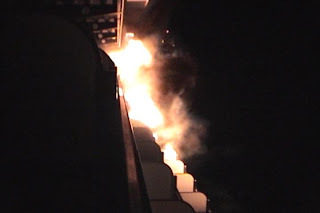 Even though the ship met the necessary fire protection requirements, a fire broke out on a balcony then spread rapidly from balcony to balcony. As a result, 13 passengers and four crewmembers suffered smoke inhalation, and one passenger died. On the morning of the incident, the sea was calm and visibility was good. At 2:50 a.m., a security patrol smelled something burning. This was reported to the officer of the watch and the area was checked. Nothing was found, but the officer instructed the security patrol to include the area during overnight rounds. Nineteen minutes later the fire turned from smoldering to fully blown. At that time (3:09 a.m.), the officer of the watch received a call from a passenger. The bridge lookout reported the same fire almost simultaneously. The photo is a still from a video taken two minutes after the first alarm. Amidst a steady stream of smoke detectors, heat detectors, and alarms going off on multiple decks, the crew’s response also occurred in rapid succession. The officer of the watch made a broadcast over the public address system and sent the assessment party to the area (3:10 a.m.). The senior first officer saw the scale of the fire and immediately requested the bridge to broadcast the crew alert (3:13 a.m.). The fire’s location was pinpointed and at 3:14 a.m. the fire screen doors were closed. In the next few minutes, the ventilation was also stopped, and the captain reduced speed to lessen the wind over the deck. During this maneuver, the relative wind shifted and the flames became more vertical. At 3:20 a.m., the passengers were instructed to go to their muster stations. Lifeboats were prepared, but the port boats waited for protection from fire hoses because the fire was on the ship’s port side. The fire started on a port side balcony and spread rapidly to adjacent balconies and up several decks. It also spread into staterooms as heat shattered the balcony doors, but was contained by each stateroom’s fire-smothering system. As the fire progressed, the balcony partitions and other combustible materials generated dense black smoke which entered staterooms and alleyways and hampered evacuation. Section leaders attempted to clear every stateroom by using keys to enter and evacuate passengers. However, one section leader didn’t have keys to dozens of staterooms, and had to bang on doors. Because telephone lines were busy, the section leader couldn’t call his zone commander to request additional master keys, nor could he inform the commander that he was unable to check those locked rooms. There was much confusion trying to piece together who was safe, especially when passengers went to incorrect muster stations. Initial headcounts and roll calls took hours because they had to be repeated several times, especially in one muster station that did not have a megaphone. The fire was likely started by a discarded cigarette that ignited combustible materials on a balcony, then spread rapidly from balcony to balcony. But why did the fire burn so quickly and densely? Aren’t regulations in place to fireproof passenger ships? The material used for the partitions and deck covering was determined by several factors, such as durability in a marine environment, weight, aesthetics, cost, and availability. Combustibility and toxicity when burning, however, were not evaluated. Previous to this incident, such concerns were only defined in regulations that were applicable to internal spaces, not outdoor balconies. This incident brought to light that the regulation’s purpose to contain a fire in its space of origin was by no means achieved. In Part II we will detail rescue efforts and lessons learned in the aftermath. Full article is available at www.uscg.mil/proceedings. Click on “archives” and "2008 Volume 65, Number 2" (Summer 2008).